New Article: Community structure via baited cameras in the Clarion-Clipperton Zone. 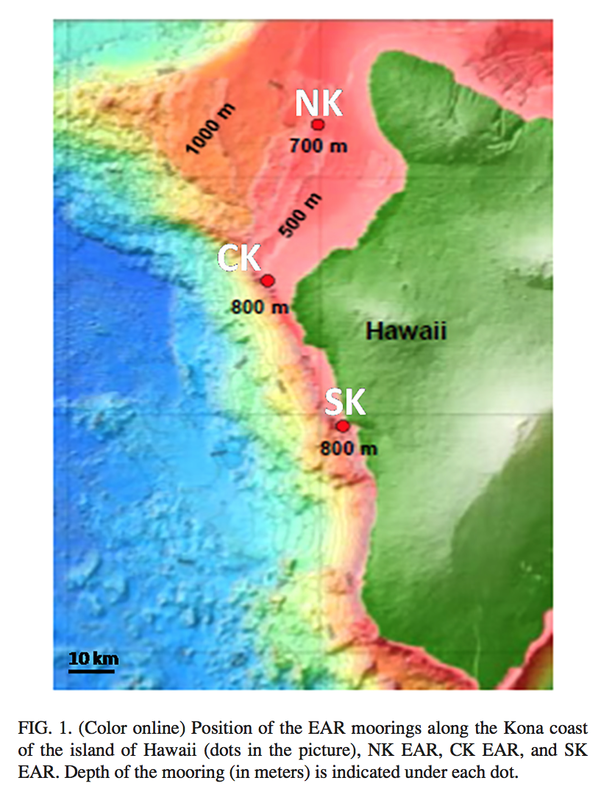 In collaboration with the Drazen and Smith labs, an article exploring community structure in the Pacific's Clarion-Clipperton Zone (CCZ) was just published in Deep-Sea Research I. The CCZ is one of the richest manganese nodule provinces in the world and the paper, led by Oceanography PhD student Astrid Leitner, documents and explains community structure variability across the province. Posted on July 12, 2017 by Anna Neuheimer. New Article: Toothed whale foraging activity around Hawai’i. A third article from our collaboration with UH’s Marine Mammal Research Program over at the Hawai`i Institute of Marine Biology is published in the Journal of the Acoustical Society of America. In the article, we use passive acoustic recordings to explore foraging activity of toothed whales around Hawai’i. Posted on July 11, 2017 by Anna Neuheimer. More coverage of lab member and recent GES graduate Jennifer Wong-Ala's work exploring larval reef fish dynamics was featured on KITV4 News. Posted on May 31, 2017 by Anna Neuheimer. GES Thesis Completion - Congrats Jennifer Wong-Ala! On 5 May 2017, lab member Jennifer Wong-Ala presented her Global Environmental Science final thesis entitled "Disentangling Biophysical Factors Affecting Reef Fish Recruitment in West Hawai'i Island". Congratulations Jenn! We're so proud of all your hard work and the stellar finished project! Congratulations also to all of today's GES Symposium presenters! Great job all around! Posted on May 5, 2017 by Anna Neuheimer. Please join us this Tuesday, 21 March for the 5th Annual Conference of Biological Oceanography Graduate Students (CBOGS). This student-run event will showcase current student research in biological oceanography at SOEST. Posted on March 18, 2017 by Anna Neuheimer. Posted on February 25, 2017 by Anna Neuheimer. The organizing committee for the XIth International Larval Biology Symposium is soliciting short proposals for symposium topics for our August 2017 meeting. If you’re interested in organizing a symposium for a particular topic, please submit your proposal through the link on the front page of the meeting website. We hope to see you all in Honolulu next August! Posted on November 30, 2016 by Anna Neuheimer. This week Anna was invited to speak at Hawaii Pacific University as part of their Marine Science Guest Speaker Seminar Series. Anna presented recent work from the Neuheimer lab exploring early fish life history variation at high and low latitudes. Posted on November 18, 2016 by Anna Neuheimer. 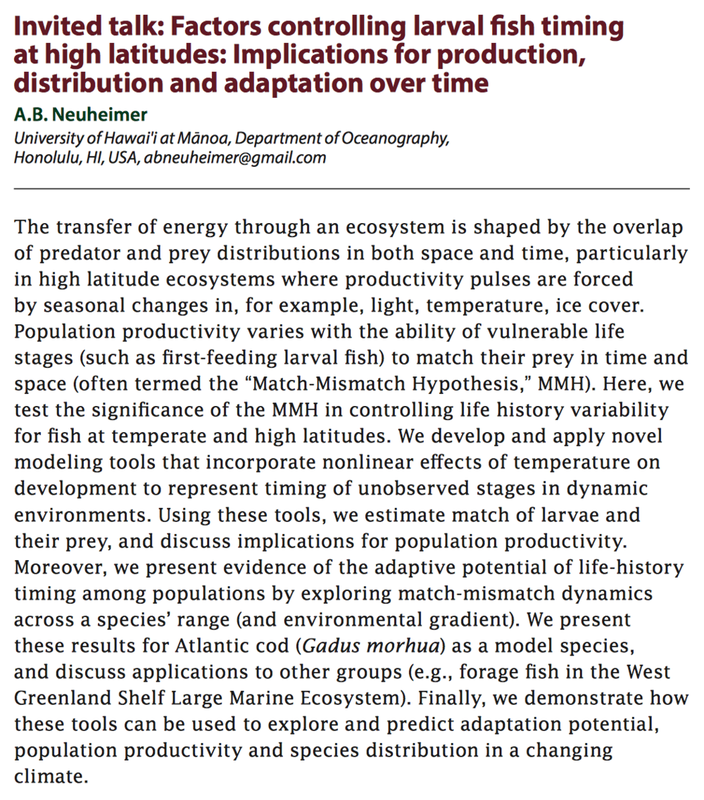 The 31st Wakefield Symposium on the Impacts of a Changing Environment on the Dynamics of High-latitude Fish and Fisheries is now accepting abstracts. The symposium will be held from 9-12 May 2017 in Anchorage, Alaska. More info on session descriptions and invited speakers is available here. Hope to see you in Anchorage in May! Posted on November 15, 2016 by Anna Neuheimer. at the 2017 ASLO Aquatic Science Meeting in Honolulu (Hawaii; 26 Feb – 03 Mar). Abstracts are due 14 October 2016. Climate change is affecting ecological processes and biogeochemical cycles of marine environments. Species respond to climate change through both phenotypic plasticity and microevolutionary adaptations. For example, across many trophic levels, species quickly respond to change is by shifting their distribution in space (e.g. population distribution) or time (e.g. reproductive events). However, there are limits to these types of responses, imposed by the presence of the limiting requirements of different critical stages in a species? life history. These limitations are linked to a species? life history strategy, with further response of the species beyond this point moving from phenotypic plasticity to genetic adaptation. There is unfortunately a chasm between phenotypic plasticity and evolutionary adaptations in the literature of marine species response to climate change. In this session we invite studies on species? response to environmental change, using both niche-based (e.g., climate-envelope models) and genetic (e.g., evolutionary models) approaches. Through this theme session we intend to develop awareness among scientists and build capacity to merge these two realities by including more evolutionary thinking in niche-based approaches and more ecological thinking in studies of species evolutionary processes. This understanding is necessary as we develop models to project species adaptability to future climate scenarios. Posted on October 10, 2016 by Anna Neuheimer. A second article from our collaboration with UH’s Marine Mammal Research Program over at the Hawai`i Institute of Marine Biology has been accepted at Deep Sea Research Part I. In the article, we use passive acoustic recordings to explore spatial variability in toothed whale occurrence in the Ligurian Sea, Mediterranean. Posted on August 14, 2016 by Anna Neuheimer. Anna is visiting Peter Grønkjær in the Department of Bioscience at Aarhus University (Aarhus, Denmark) for the next two months to collaborate on ongoing research of high latitude fishes. Posted on August 3, 2016 by Anna Neuheimer. Neuheimer Lab MSc defence - Congrats Chantel! On 15 July 2016, lab member Chantel Chang successfully defended her Oceanography MSc thesis entitled "The Influence of Biophysical Factors on the Connectivity of Holoplanktonic Copepods". It was a wonderful celebration of all Chantel's hard work and excellent contributions to our lab and department. Congratulations Chantel! Posted on July 16, 2016 by Anna Neuheimer. Anna is at CSU in Fort Collins, CO this month to attend a NSF-funded (award #: DEB-1145200) Bayesian modelling workshop presented by Drs. Tom Hobbs, Mevin Hooten, Kiona Ogle, and Maria Uriarte. The workshop follows material in Drs. Hobbs and Hooten's 2015 book Bayesian Models: A Statistical Primer for Ecologists. Posted on May 20, 2016 by Anna Neuheimer. Congratulations to this year's C-MORE Scholars, including our very own Jennifer Wong-Ala! Best of luck in all your future endeavours, Scholars! Posted on May 18, 2016 by Anna Neuheimer. Chantel and Anna are in Bergen this week for the ICES/PICES 6th Zooplankton Production Symposium. Come check out our poster "Can biophysical processes explain copepod connectivity and distribution across the Atlantic Ocean basin?" (#136, Tues. 10 May, 17:45-19:45). A big mahalo (takk!) to PICES for providing Chantel with a grant to support her travel to Norway. Posted on May 9, 2016 by Anna Neuheimer.